A cultivar of Camellia japonica L. ‘Leaves large, often of the colour and form of those of the single red camellia, or those of Variegata plena; buds with greenish scales; flower three inches in diameter, double, rose color, No.4; exterior petals regularly arranged in three rows, broad, sometimes spotted with white; those of the centre swollen, folded upon the ovary, twisted, mixed with some stamens and often striped with white. – Very handsome.’ [Berlèse Monography p.54/1838]. A cross between ‘Celsiana’ and ‘Luteliana’ it was probably bred in Paris. [ICR]. Berlèse gives its origin as Paris in 1830. [Berlèse Monography p.97/1838]. Berlèse also describes and figures three camellias with the name ‘Spectabilis’ in his Iconographie: ‘Spectabilis grandiflora (pl.182); ‘Spectabilis maculata Loddigesii’ (pl.210); and ‘Spectabilis de Loddiges’ or ‘Loddigesii’. [Berlèse Iconographie vol.III pl.210/1843]. Listed in all published catalogues [T.262/1843]. It seems likely that Macarthur grew either ‘Spectabilis maculata Loddigesii’ or ‘Spectabilis de Loddiges’, obtained directly from Loddiges’ Nursery. 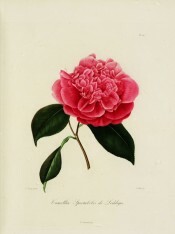 This is supported by the fact that Camellia japonica spectabilis is marked with a ‘c’, denoting grown at Camden, in a copy of the 1836 Loddiges’ Nursery catalogue held at Camden Park [CPA]. Spectabilis is not listed in the 1830 edition. ‘Spectabilis de Loddiges’ is figured here. It conforms well to the description of ‘Spectabilis’ except for the lack of white streaking and spotting, although this is not a constant feature.